All babies who are baptized here at Christ King are bestowed with a special gift. Instead of the flimsy, felt stole many of you may remember, the newest members of our parish are given a crisp, hand-embroidered one. The new stoles are personalized with the child’s name and the baptism date. It is a special remembrance of their day. Sharon Whittle is the beautiful soul creating each stole. In 2010, when Sharon took over the responsibility of making the baptismal garments at St. Bernard after her dear friend passed away from cancer, the garment was more like a bib. In 2012, Fr. Michael Barrett suggested to Sharon that it would be nice to have more of a stole look, and Sharon added the child’s name and baptism date to make them even more special. At that time, she was making about 25 bibs a year. 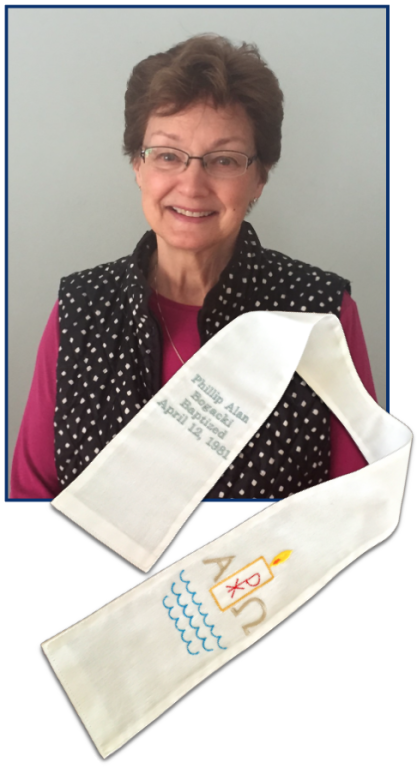 In 2016, Sharon began to sew the stoles for Christ King. Who knew what she was getting into – there are a few more baptisms here. Sharon is now making anywhere from 80 -100 stoles a year. All of them are personalized and Sharon prays for each baptized baby and family as she is making them. Recently, Fr. Dennis Saran reached out to Sharon to bring her talent to St. Dominic’s in Brookfield. He loved the gift of the stoles and wanted to share it with his parish. Sharon graciously agreed to share her talent and taught a few ladies the entire process. Sewing has been part of Sharon’s life since she was 12. Her mother, who was a self-taught seamstress, taught Sharon and she continued to sew for her own family. About 15 years ago, she added an embroidery machine to her repertoire. She also started a small business of making and embroidering personalized flannel baby blankets. Sharon has been retired from the dental hygiene world for about five years and stays busy with her 3 kids and 7 grandchildren and her sewing! Sharon has made over 500 baptismal garments in the past nine years and has a record of all of them. It brings joy not only to Sharon making the stoles, but to the child and family receiving it. We are blessed to have Sharon doing this ministry for our parish. If you are a seamstress and would be interested in this ministry please contact Sharon. Also, contact her if you would like to order a flannel baby blanket. You can also help Sharon by purchasing a gift card to JoAnn’s (Scrip is available) where she buys all of her materials. Sharon Whittle 414-475-6435 or click here to send her an email message.